Nothing says Christmas like going hunting for houses all decked out in lights and more inflatable woodland animals than you could poke a stick at. I know I’m not alone in saying I love to go for a drive around my local area to check out the houses game enough to get fully into the spirit of the festive season, covering themselves in the brightest and best light displays they could conceive. But unfortunately, all those bright, flashy lights lead to distracted driving, so what’s better than going on a tour of houses? Having the spectacular parade pass you. Of course I don’t mean literally. 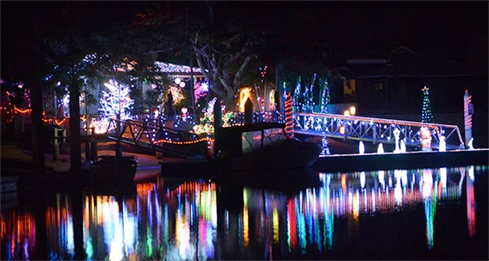 On the Sunshine Coast we have a little event called the Christmas Boat Parade. 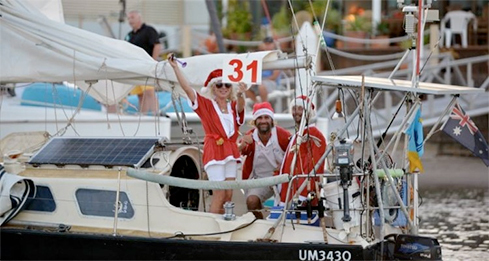 It takes place in mid-December, where everyone and their reindeer go all out decorating canoes, yachts, speedboats and houseboats, get dressed up and parade down the waterways of Mooloolaba, all in the name of charity and Christmas cheer. Each entrant in the parade must pay a $25 entry fee, which goes straight to a charity organisation – this year’s charity of choice; RACQ’s Careflight. Careflight is a not-for-profit group that provides invaluable medical support for those in need, from the sickest and most alienated of rural residents, to those in desperate need of rescue on, or off, the land. “CareFlight’s iconic blue and yellow helicopters and crew remain on standby 24 hours a day, 7 days a week, 365 days a year, watching over a flight region extending nearly a quarter of a million square kilometres south into New South Wales, north to the town of 1770, west into the Surat Basin and up to 100 nautical miles out to the Coral Sea”. The group is heavily dependent on funding from events such as these. 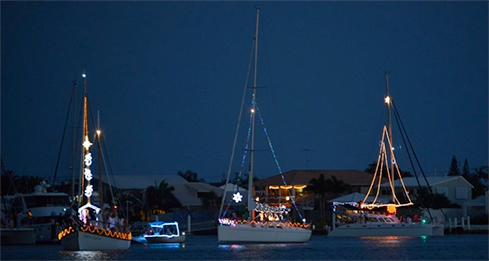 So if you’ve got a boat, and the creative flair to pull it off, or are just looking to have a good time with friends and family on the water this December, please enter yourself into the parade and help support this great cause. Last year the parade generated a total $1,055 for the Maroochydore Neighbourhood Centre with over forty entrants, with views to make it bigger and better this year. Even if you don’t own a boat, there are plenty of viewpoints along the route of the parade and community support for the event is greatly and warmly appreciated. And for those who are lucky enough to have houses along the shore, owners are encouraged to participate as well, with a house-decorating category as part of the event. The course is yet to be announced, and will be posted on the event’s webpage soon. The event will be held on the 20th of December, starting at 6:30pm with entries beginning soon. For more information on RACQ’s Careflight visit their website here.